This awesome game will distract you from daily routine! 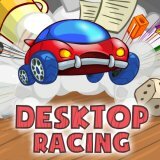 Drive your car along the desktop and through the chaos made of different things straight to the finish line! Perform stunts and do not let any huge orange smash your car!